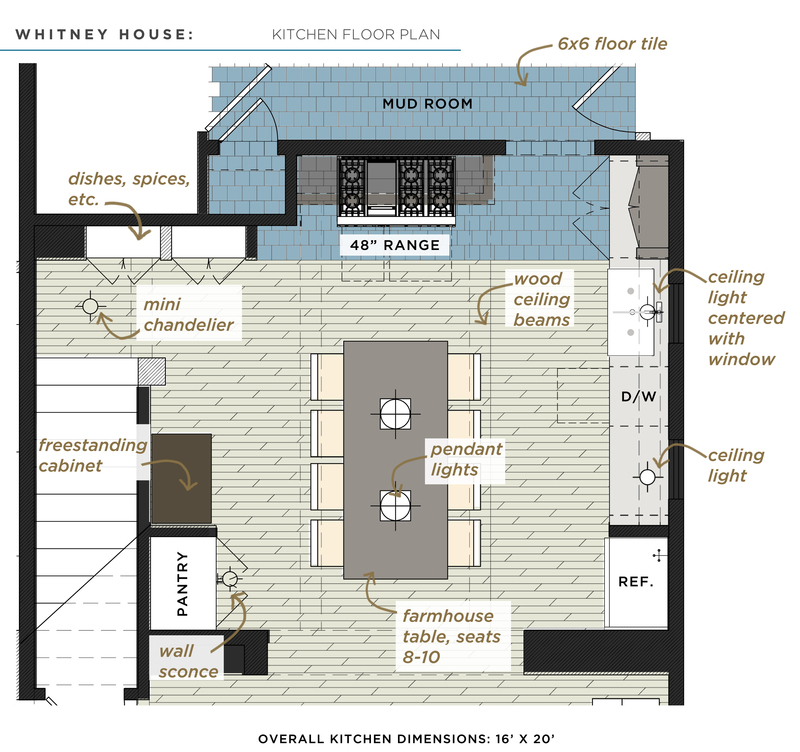 You are here: Home / Dream House Design Series / Whitney House. The Kitchen. This is the sixth post in the Dream Home Series for the Whitney House, and we’re going inside! The first room I started thinking about for this dream house was the kitchen. Probably because it’s the most used space in any house and represents “home” better than any other room. Being the meaningful room it is, this has developed into a lengthy post today. But I promise it’s filled with ooey-gooey goodness. In the Whitney House, this is the room that first greets you when you come down the stairs each morning. And hopefully someone’s making bacon. Here’s a look at the floor plan. I made a few tweaks on the plan from what I showed earlier like shifting the windows a few inches and adjusting where exactly the storage cabinets would be. I also gave some thought to the wall with the range and decided to do something a bit different. In every kitchen I’ve designed for clients in the past the cooktop is incorporated into the cabinetry. It makes sense because you need countertops nearby for setting things on. 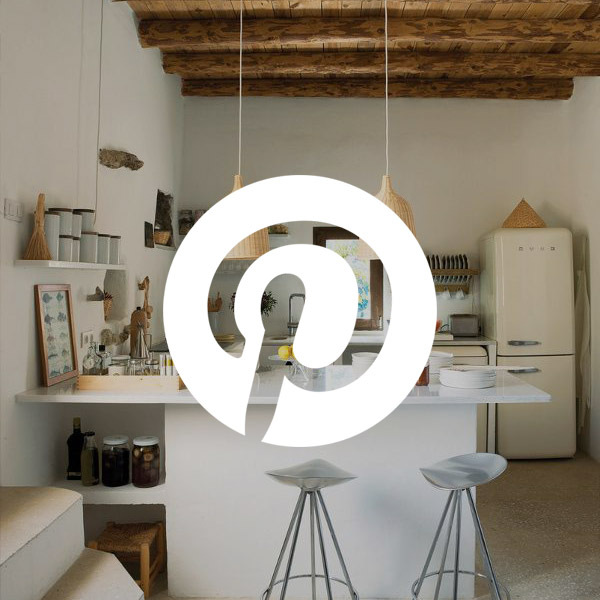 I envisioned something different for this kitchen though. I was thinking about what life might have been like in an old American Colonial home, of which this house is modeled after, where the hearth was the heart of the home. 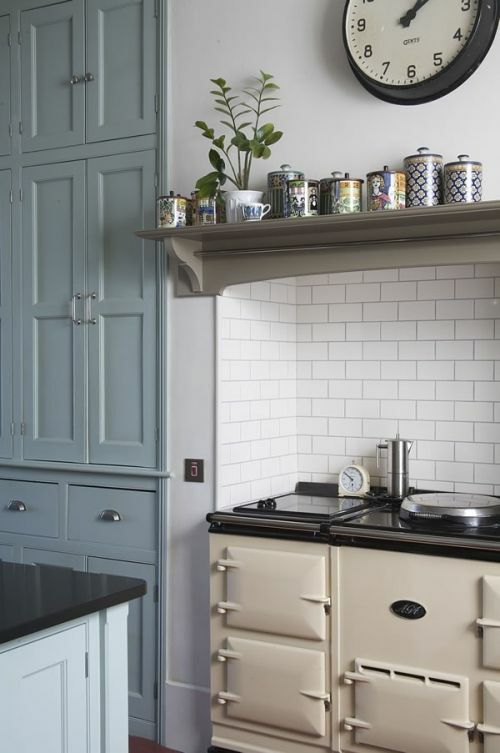 I liked the idea of making the cooking area the focal point too by using a wide freestanding range surrounded by beautiful tile as a way to invoke the spirit of an early fireplace. As the tool that works hard to produce meals each day, I wanted to emphasize the presence of this appliance and highlight its value. 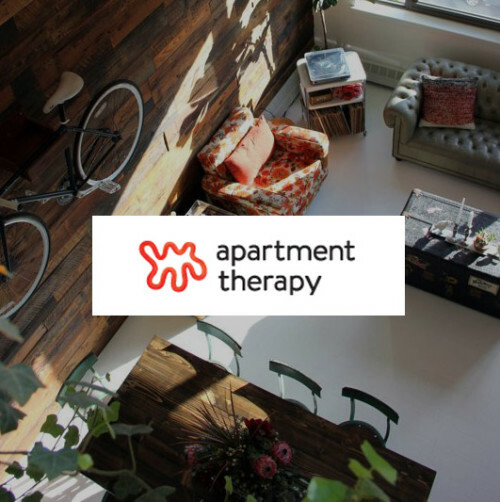 On the plan you can see how the range enjoys its own wall and is the first thing you see as you enter the room from either the main living space or the stairs. 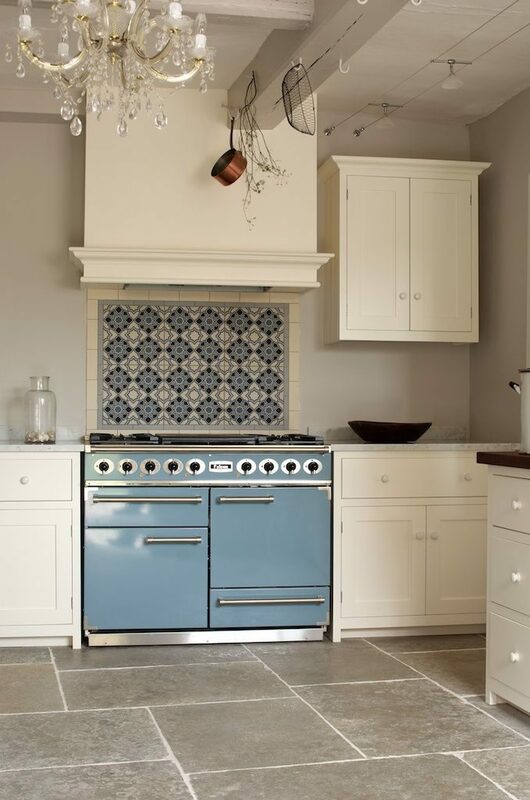 I love love, love, love that blue on the above-pictured range and I found a hand-brushed terra-cotta tile in a similar color (amusingly called “Colonial Blue“) that I would actually want to use on the floor beneath the range as well as in the mudroom which you can see on the plan. It comes from a studio that produces stunningly BEAUTIFUL tile, Tabarka Studio, in Scottsdale Arizona. For the tile behind the range I liked the idea of continuing the same material as the front entry. 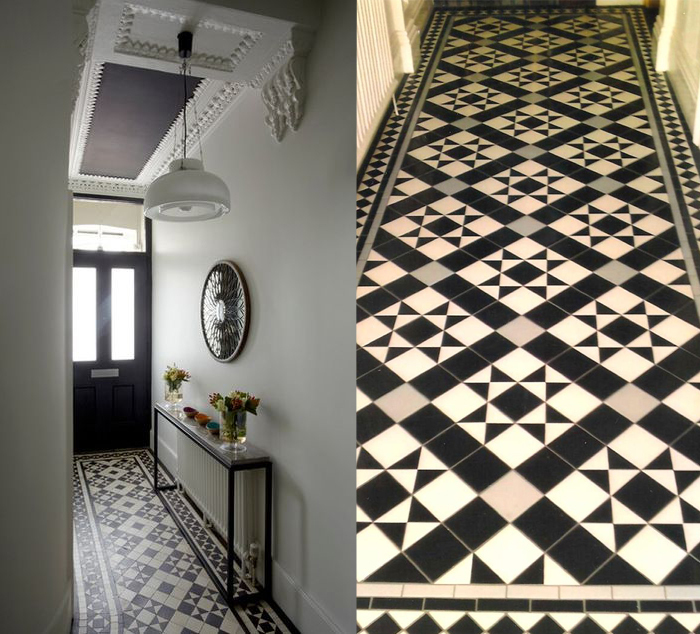 It’s a bold geometric pattern of black and white victorian square and triangles tiles. It seems flooring is the expected application for these tiles but I don’t see why it couldn’t be used as a backsplash also. Since pictures are worth a thousand words, here’s the elevation I drew up of this wall. 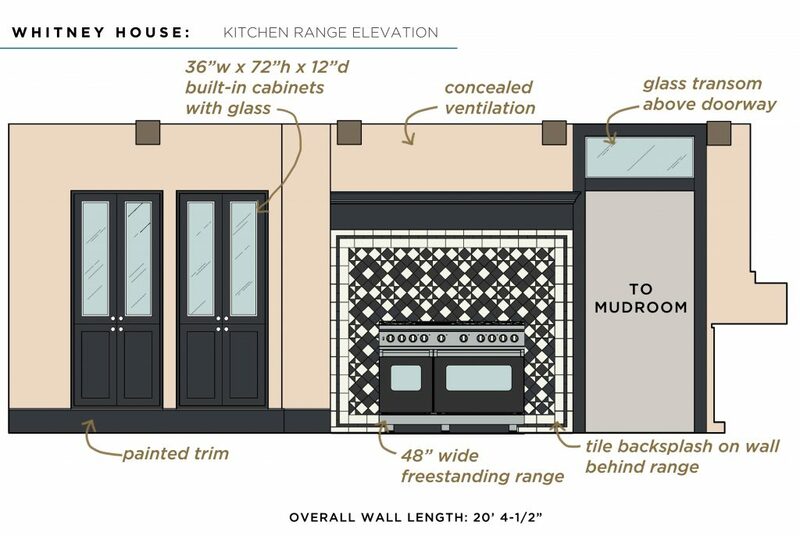 As I drew the tile I got excited as it reminded me of an old quilt—perfect for my modern spin on the colonial home. I love that it’s bold but still classic, and that I could use variations of this pattern in the bathrooms too. Now, you might be wondering how practical this range set-up would be. Where would you prep and cut? Wouldn’t it be a cleaning nightmare? I thought the same. But I found that for wider commercial appliances like this 48″ Viking, you can get cutting boards that fit on top. I also think that I would sit at the table and cut vegetables there instead of standing at an island. I bet my back would thank me! I also made sure to have cabinets nearby for spice storage (the tall cabinet to the left of the range) and the base cabinet for pots is just to the left of the sink. You could easily prep food there as well. I also think it would be easy to fit a small moveable kitchen cart nearby if needed. And as far as cleaning goes, I think this design would force me to sweep often as food scraps would have nowhere to hide. This would eliminate that dreadful chore of apprehensively pulling out the stove from the wall—a terrifying moment of discovery followed by self-disgust. Yes, I like the idea of knowing right away what I’m living with and keeping this particular appliance exposed. 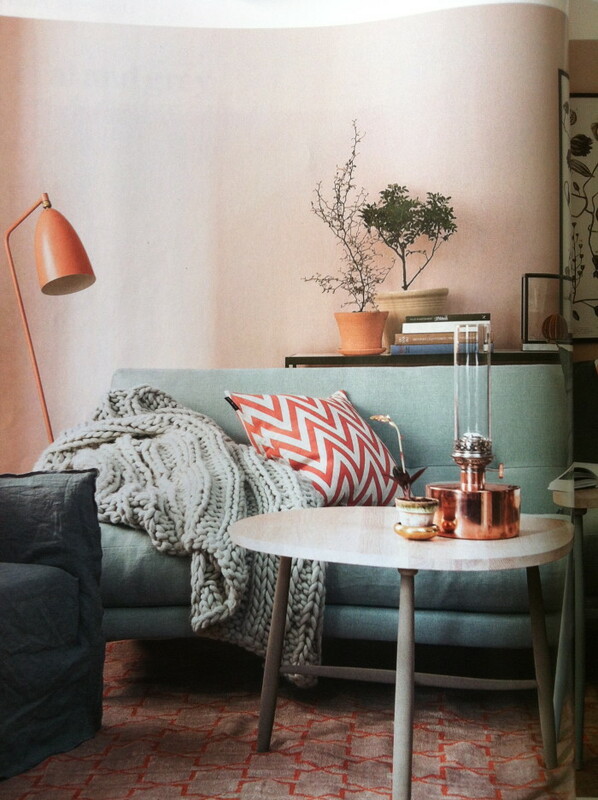 I want this room to feel warm and inviting, and not so kitchen-like. 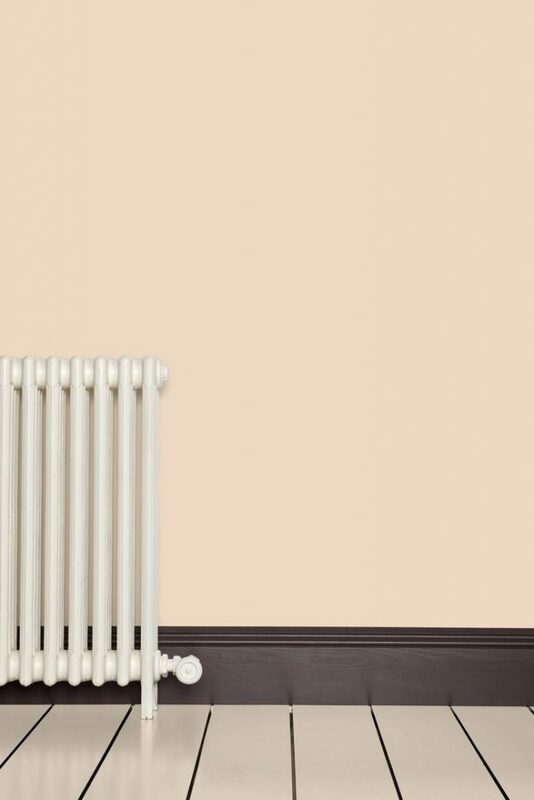 A central wood table definitely contributes to this, but a key element is the paint color. 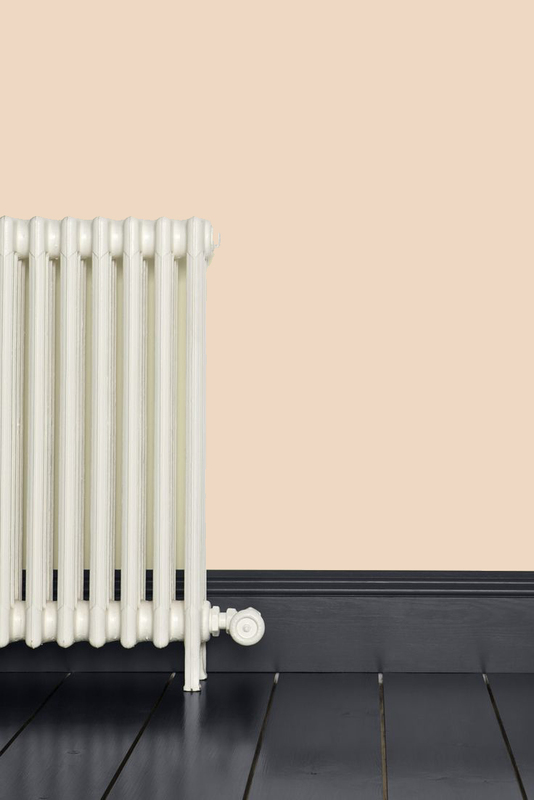 I initially thought a warm white since I like bright kitchens, but somehow I fell in love with a color that really took me by surprise when I found it. It’s called “Setting Plaster” by Farrow & Ball. “Setting Plaster” isn’t as deep and has a gentleness and slightly peachy feel which makes it warm and happy to me. Here are some pictures of rooms painted in that color. As you can see in the last picture it definitely has yellow in it and brightens up a lot in the light. Right? Now I know you are with me. For the trim I’m thinking another Farrow & Ball color called “Railings“. It’s a soft black with blue undertones so I think it will pair well with the wall color and balance it out. It may make the pink pop out even more and I kind of like that idea. 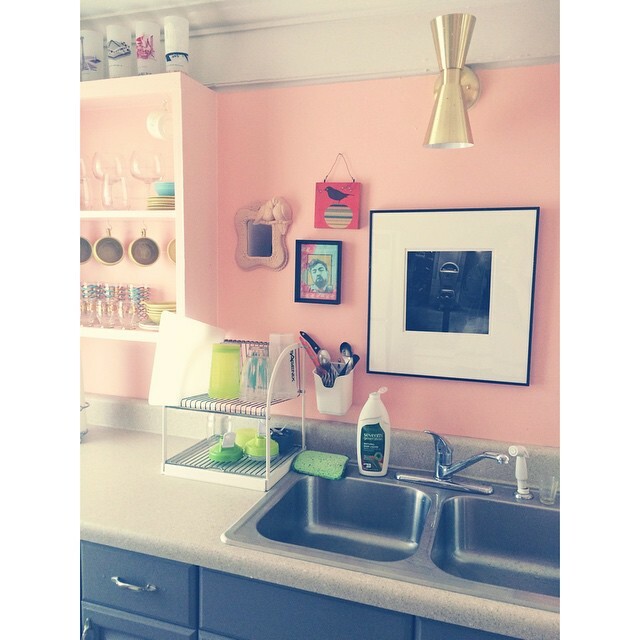 Here is a kitchen where that color was used on cabinets. And the visuals continue, folks, with this next elevation I created. 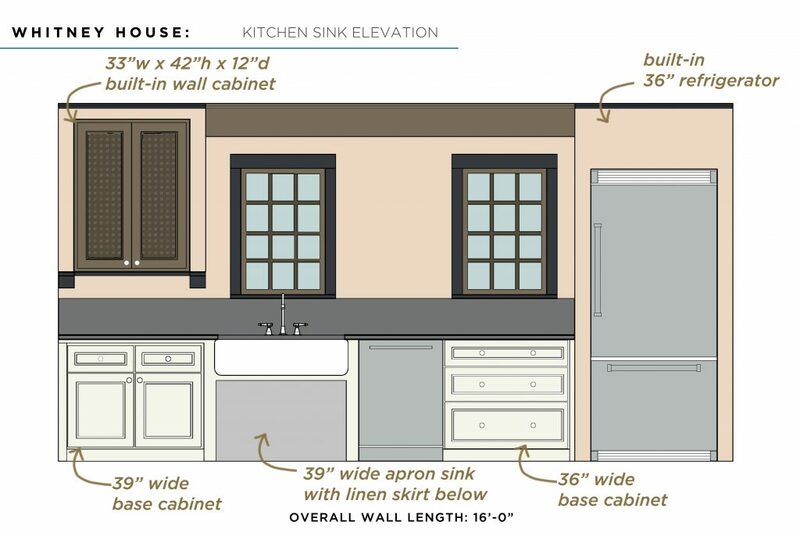 Here is the sink wall. To keep things open, I’d only have one wall cabinet in the entire kitchen, which is the one shown here. It’s treated a bit differently too in a stained wood with possibly a decorative caning treatment in the inside panel. 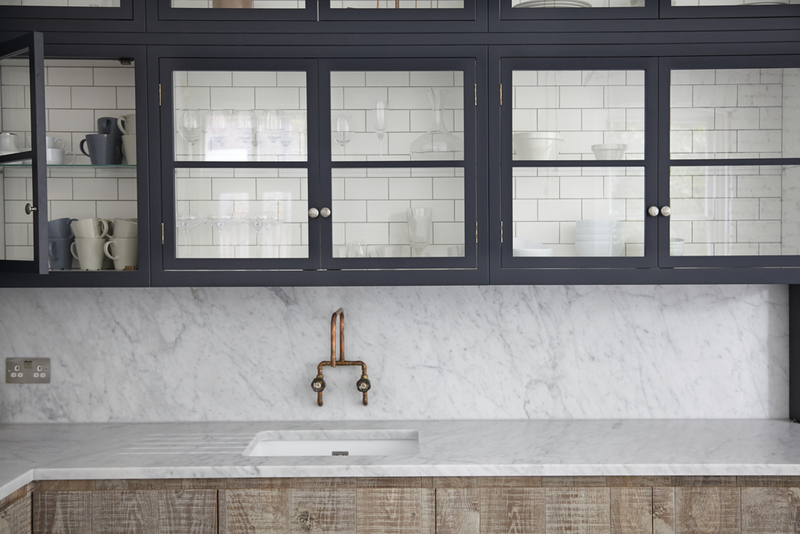 Elsewhere there are full-height cabinets, so there’s still plenty of storage. I am thinking of mounting two semi-flush fixtures on the ceiling; one above each window. I also like the idea of a linen skirt below the sink instead of cabinets to break it up and bring more fabric and warmth to the space. 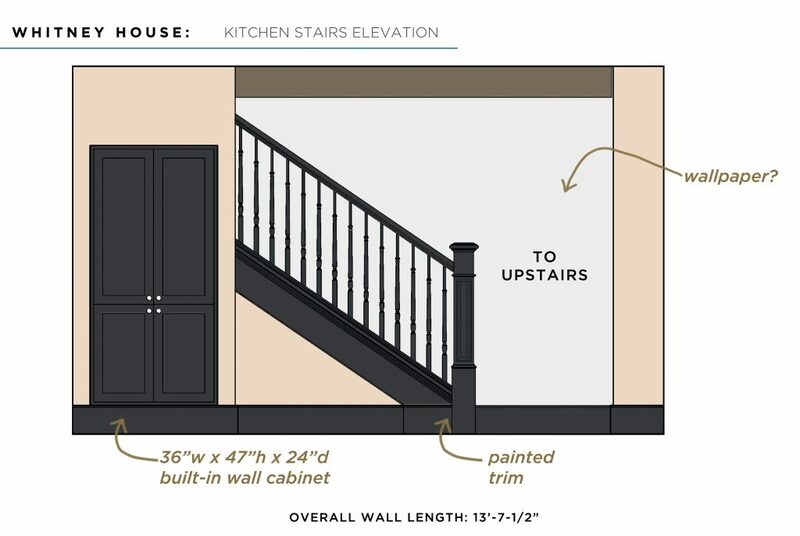 And here is the elevation for the stair wall. I thought about open shelves, but I’m planning on having lots of open bookshelves in the living room, so I decided to leave the storage behind doors. Here you can see the large built-in cabinet. It most likely would just be 24″ deep on the bottom and then 12-15″ deep on the top. 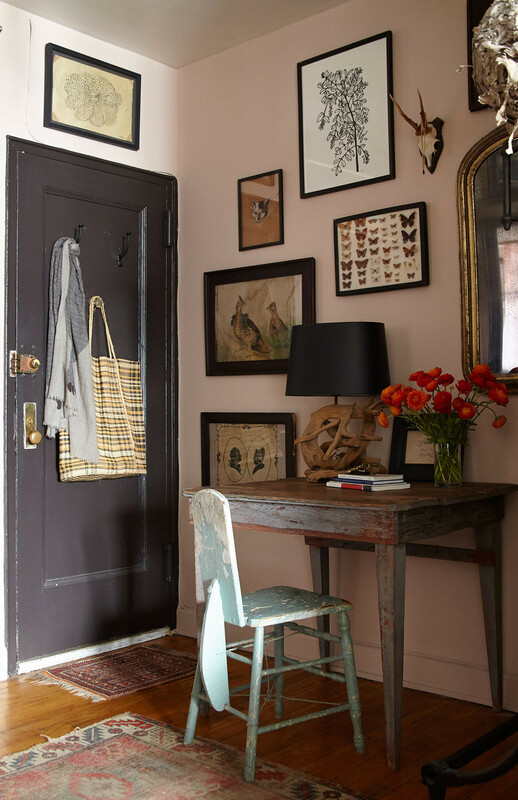 There’s also space below the stair railing for a little antique cabinet like this. 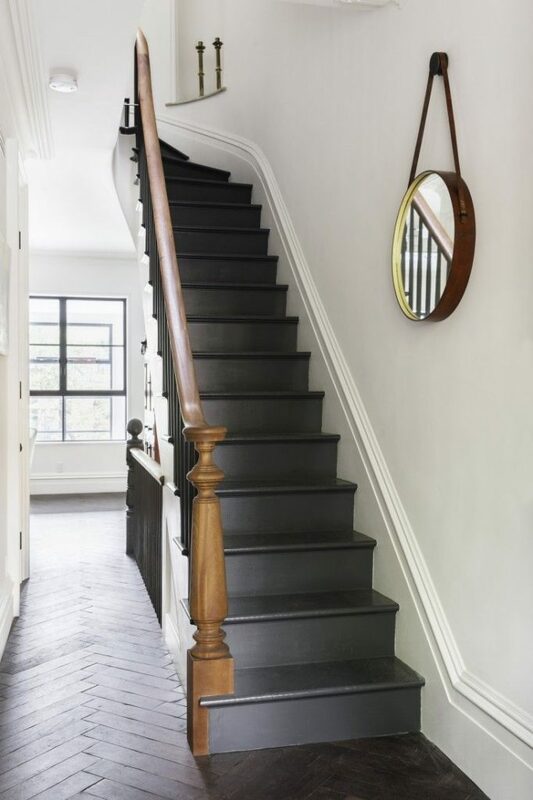 The stairs in this picture are painted in “Railings” and I like this idea of leaving the handrail in stained wood and then painting both the treads and risers. 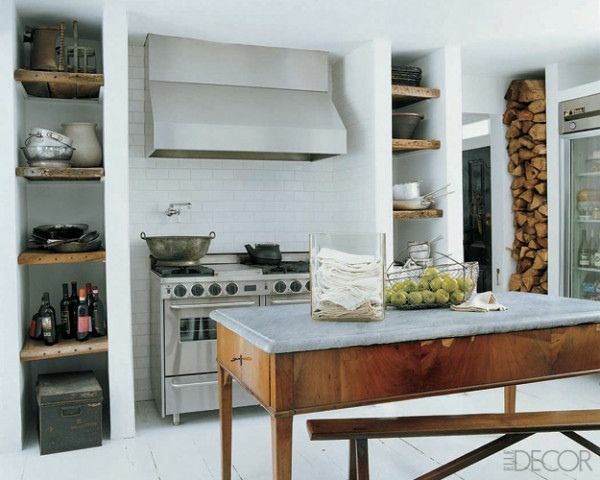 And then, to make this kitchen that much more layered and warm, why not bring in some wallpaper? 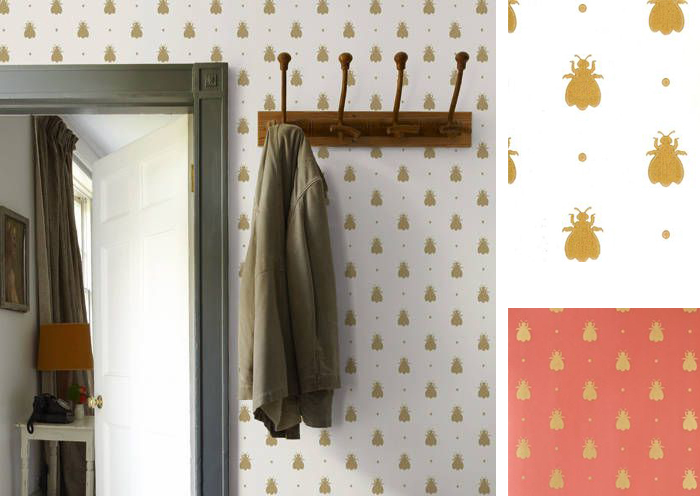 As I was on Farrow & Ball’s website, I stopped at their wallpaper page and came across this wonderful Bumble Bee pattern. I think it needs to be on the stair wall. Perfection! 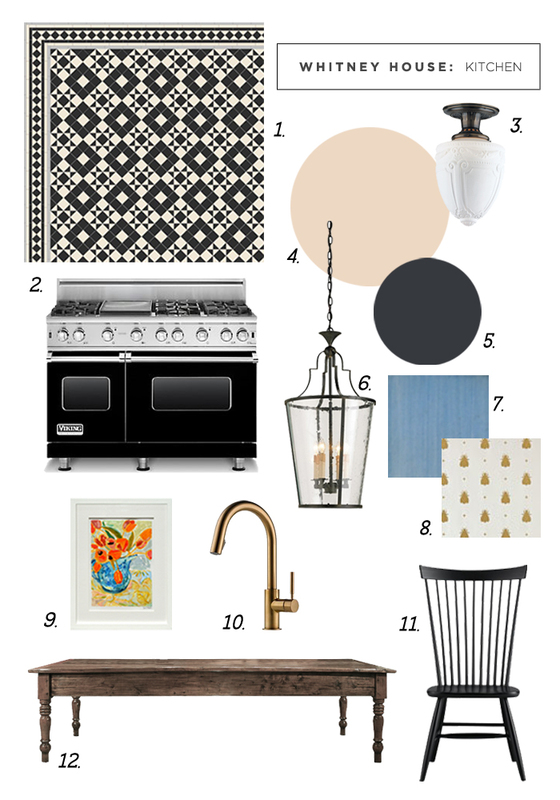 To wrap things up, I’ve put together a final mood board of this delightfully warm, classy, soft-yet-bold, kitchen. Wall Tile Behind Range: “Braemar” Victorian Tiles. Original Style. 48″ Freestanding Range: 7 Series in Black. 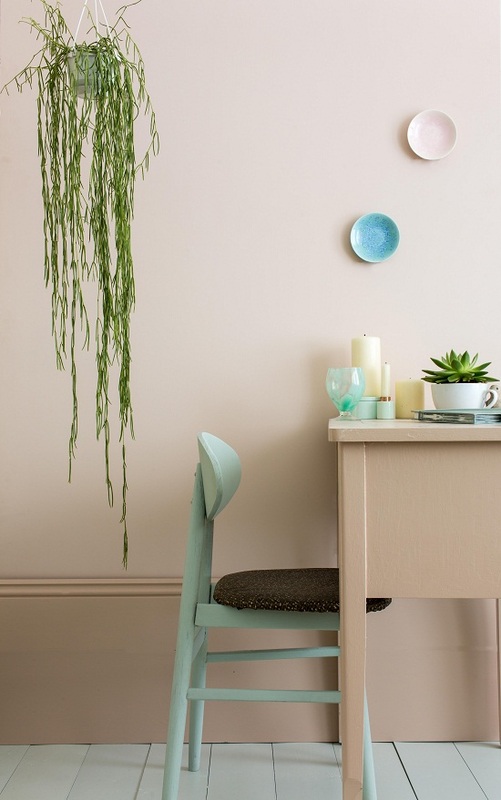 Wall Color: Setting Plaster. Farrow & Ball. Trim Color: Railings. Farrow & Ball. Lantern Pendant: Currey and Company. Tile: 6×6 Terracotta Tile in Colonial Blue. Tabarka Studio. Wallpaper: Bumble Bee. Farrow & Ball. Art: “Orange and Blue” by Lynne Hamontree. Serena & Lily. 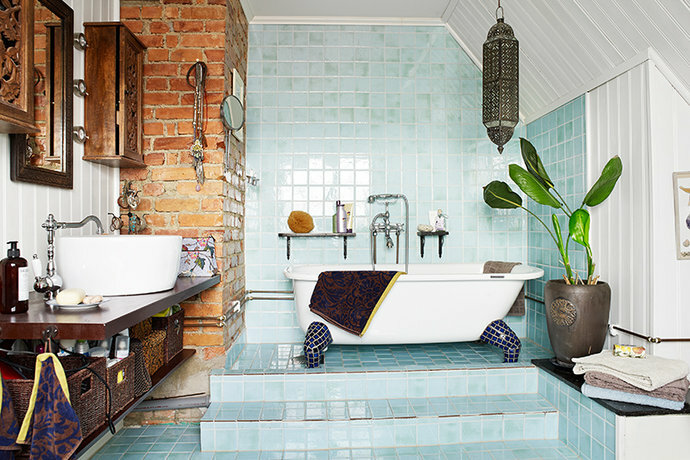 I want to take a bath in that tub in that blue-tiled Moroccan inspired treasure-filled bathroom. The final mood board came together great. 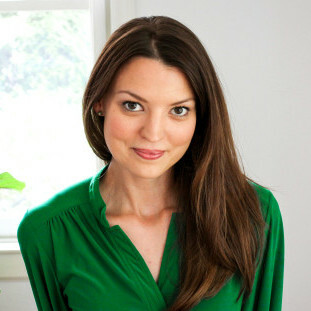 A wonderful guide to creating a very loved kitchen. I love that bathroom – such a great mix of materials! this is so gorgeous! I am loving all of your choices! did you use autocad for the elevations? So pretty! Thanks Christy! Yes, I did use AutoCAD!